On 25th of August 2014, we had the third group of Warwick volunteers. They came on the farm at 1.00 pm. We had lunch together and then decided to visit all the centres during the evening. When we visited all of the centres, they just observed the teachers. The students and teachers welcomed the Warwick volunteers. 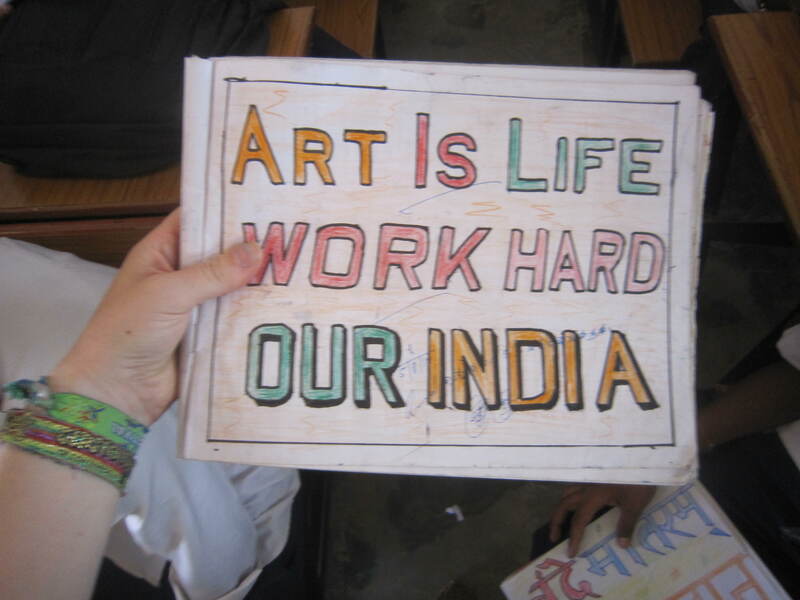 Do arts & craft – ask the students what they have drawn/painted and why. After the discussion, we divided the volunteer teachers into four groups for lesson planning. The first group planned the lesson for up to the 3rd class; the second group planned for 4th to 6th class; the third group planned the lesson for 7th and 8th class and the fourth group planned for 9th & 10th class. To give an example, 9th & 10th class English lesson topic was ‘present simple and continuous tense’ and then Maths lesson topic was ‘multiplication and division of decimal fractions’. We are still using the previous structure of lesson planning implemented by the previous groups (starter, activities 1 & 2 and then recap). The Warwick volunteers helped us very much in lesson planning as well. Kim helped first group, Cat helped second group, Sara helped the third group and Ash helped fourth group. All the groups made different lesson plans according to the class and age group. By dividing the teachers and assigning each Warwick volunteer to a group, the teachers are benefitting from one on one mentoring and Warwick volunteers can correct any mistakes in the lesson plans and help them individually to improve their skills. Evening:- We divided the Warwick volunteers into two groups. 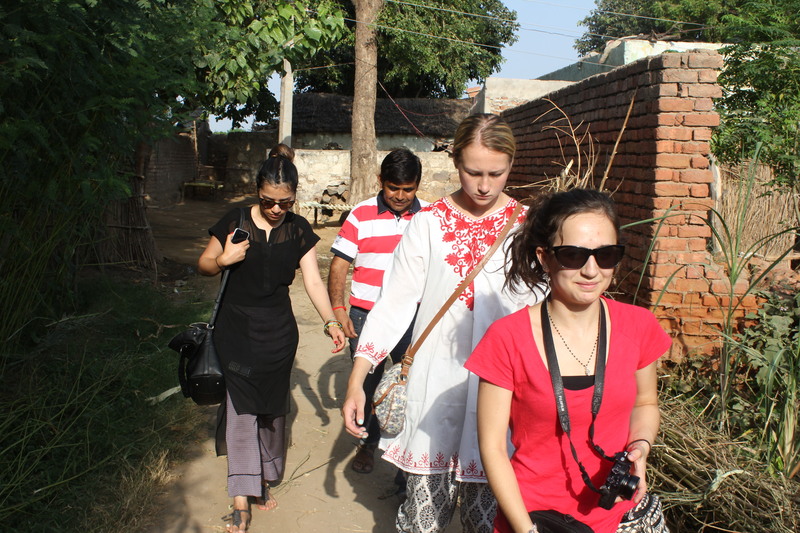 Ash and Cat went to Dhauj centre and Kim and Sara went to Silakari Village centre. I visited four centres today and I was happy to see the effect of morning training classes. I saw lots of changes in the teaching methods and I was especially very happy to see the tremendous changes at Alampur centre because previously we have experienced problems there. There was very good class management and discipline. As you know, it’s a big challenge for us but we are improving day by day. On 20th August 2014 The Warwick volunteers and I visited the Govt. High school at Manger village. It is situated on the top of the hill. There we met the Principal Mr. Raj Singh Sharma. He welcomed us very well and was happy to see the volunteers in the school. We met the other teachers in the school as well. We saw the art and craft stuff in the school library, all of the stuff was made by the students. We were surprised to see the creativity of the pupils. It was a fabulous and inspirable visit to us. 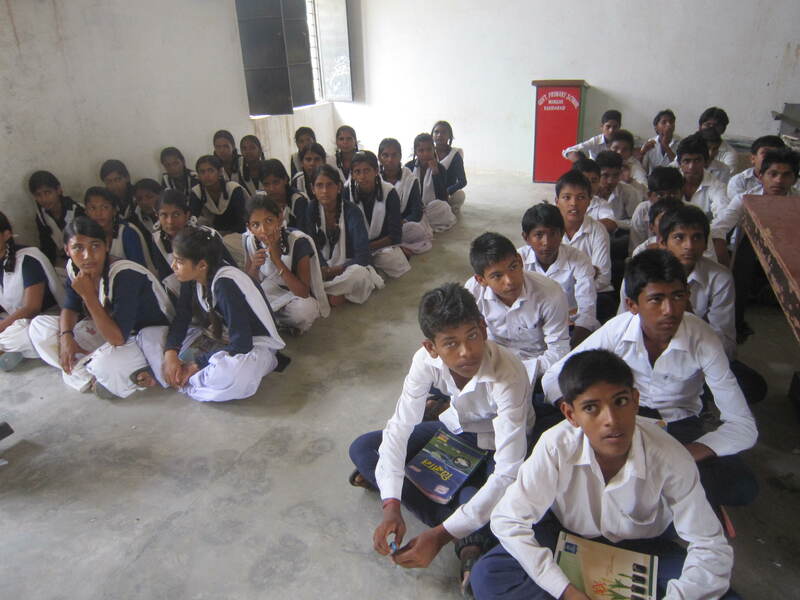 The Govt School has 6th to 10th class right now and there are 250+ students are studying in the school. All the Girls and Boys are very creative. 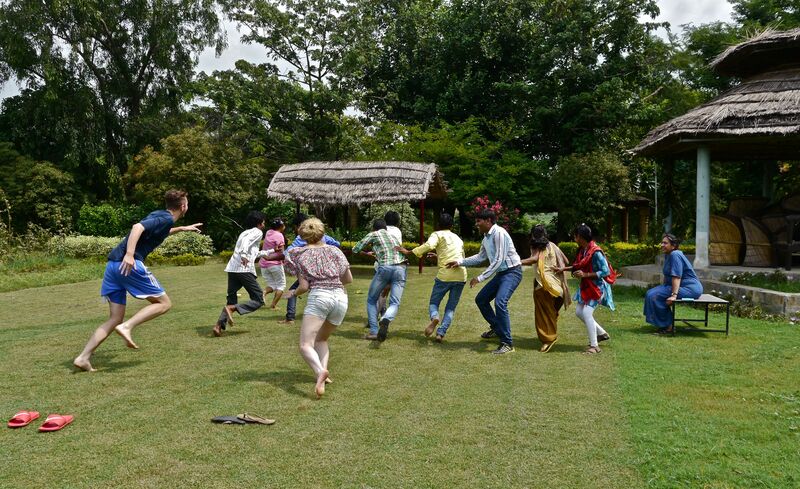 On 22nd August 2014 we organised a farewell party for the group two of Warwick volunteers. We played “Lion king” and danced a lot. We had a great fun with them. It was a really good experience for all of us. Evening time we all went to the all centres to say bye to the kids. All of the students and teachers were very sad and the Warwick volunteers as well. They captured photographs to the students and said goodbye to all of them! On 23rd August 2014 the volunteers drew some painting in the library for example: – Suzy drew a cat and chicken, Molly drew a camel, Sarah drew a small elephant with a quotation. We all went to Shokeen’s house in the evening, he made us feel very welcome and his family provided excellent food. Flag hoisting and Library inauguration. 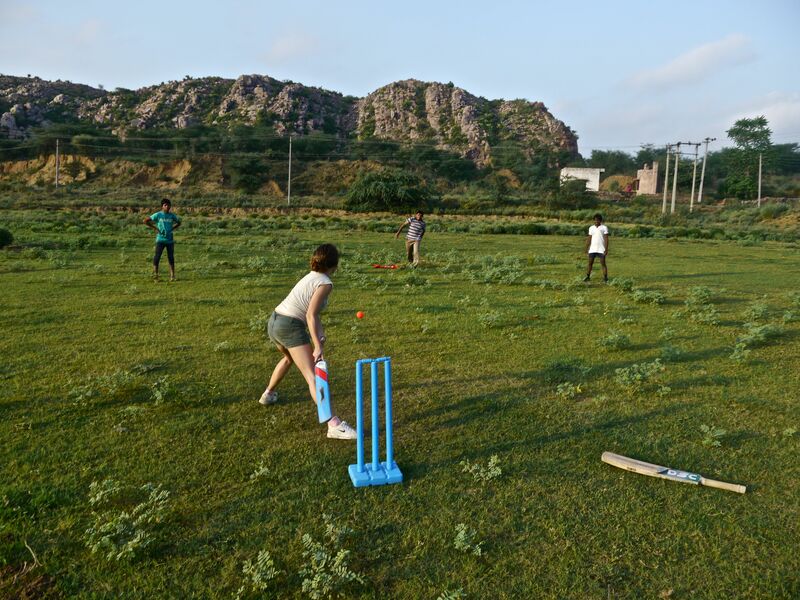 Friendly cricket match: – We had two teams, team A and team B. 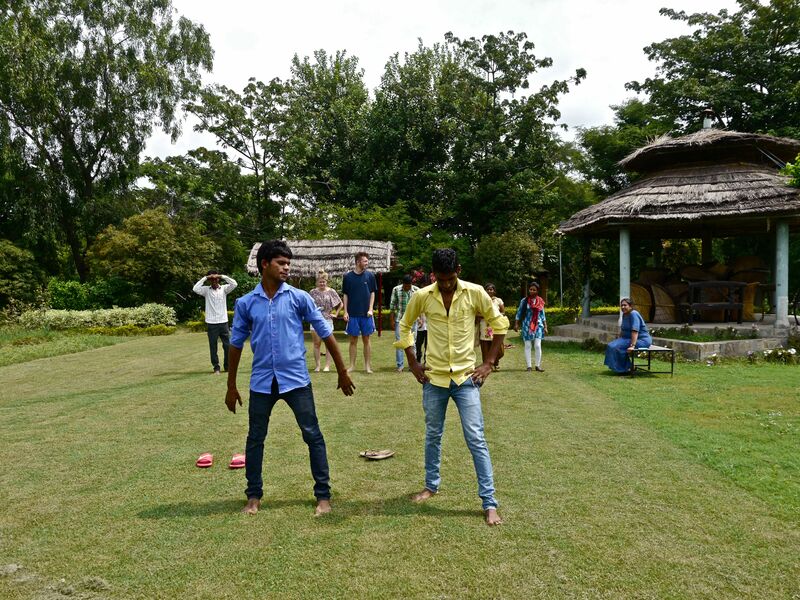 Team A captain was Mr. William George and team B captain was Mr. Ramesh. Ms. Sarah was the umpire for the whole match. We played it 6.30 to 8.30. 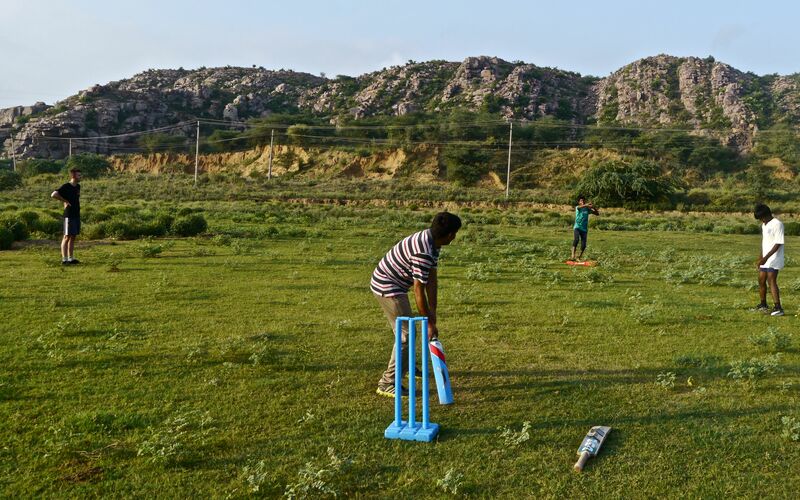 All the volunteer teachers and some older students participated in the cricket match. We played two matches in the session. First match we played five overs and the other we played ten overs. First match won team B and the second match won team A. We had lots of fun during the cricket. 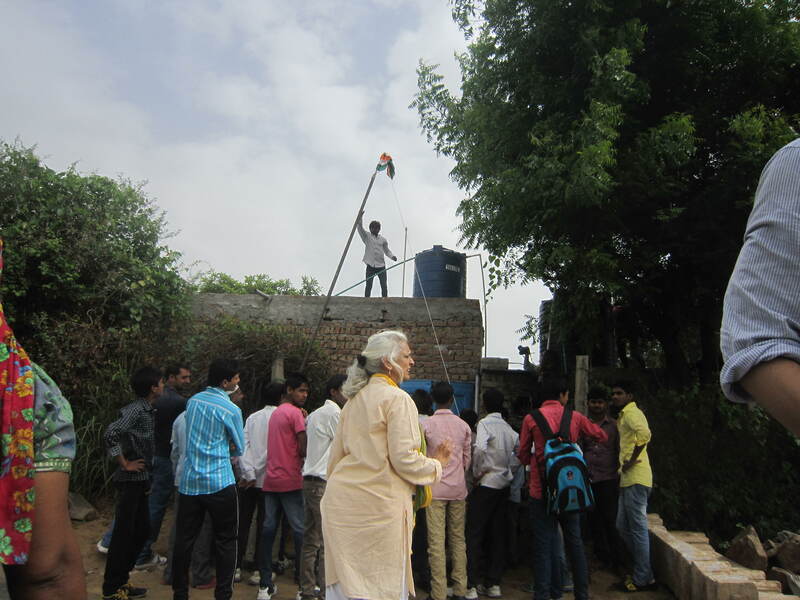 Flag hoisting and Library inauguration: – First we hoisted the flag and then did the library inauguration. Mr. William George was the chief guest and he hoisted the Indian national flag (Tiranga) and gave the guard of honour. We all sang national anthem (Jan, Gann, Man,) and a patriotic song by students. Our chief guest addressed to all of us and encouraged education. He appreciated all of us. He liked our efforts made for community development. 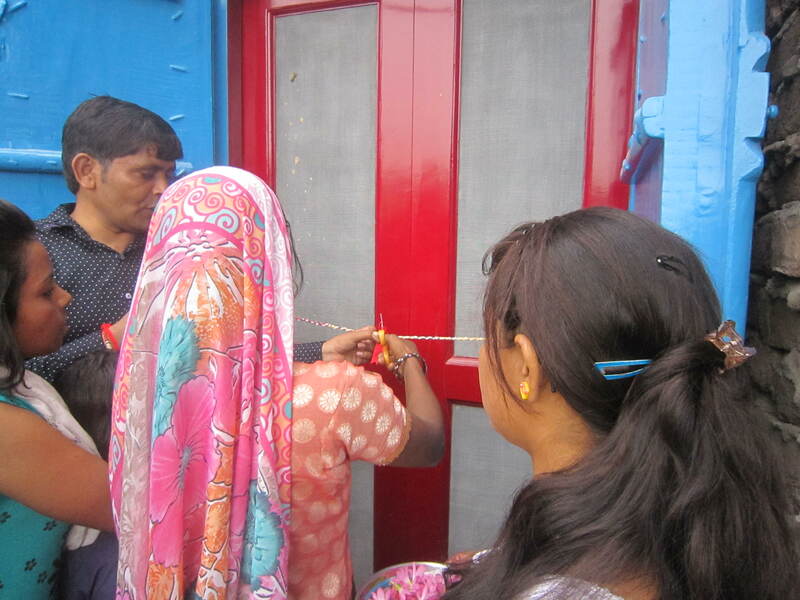 Ms. Sanjay and Chanchal one of the students cut the ribbon and inaugurated the library and handed it over to the volunteers and teachers to use it as well. In the mean time we had refreshment. We had Jalebi and Samosa. It was such a great experience for all of us. 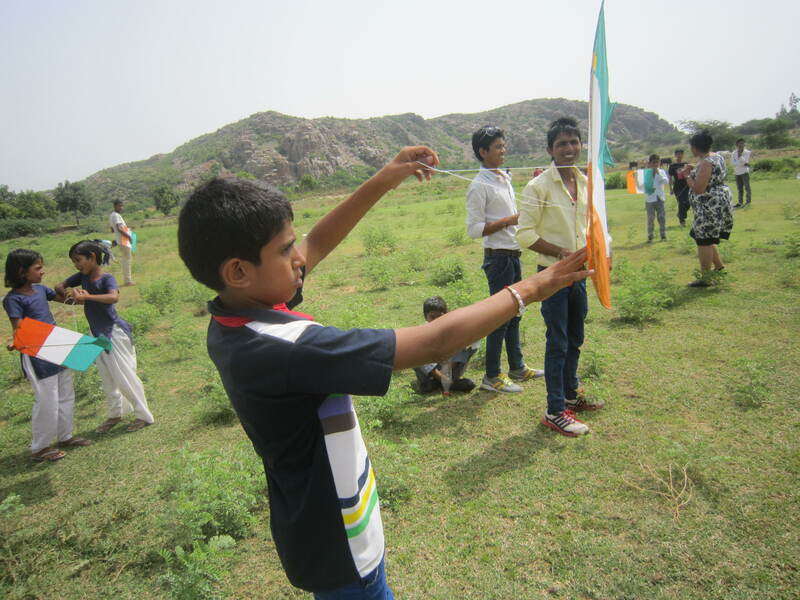 Kite flying: – After this we flew kites on the same ground where we played cricket. We enjoyed it very much all of the students were looking very happy on that day. Thus we celebrated Independence Day gracefully with Warwick volunteers and students. It was really funny and we all were very happy with the celebration. 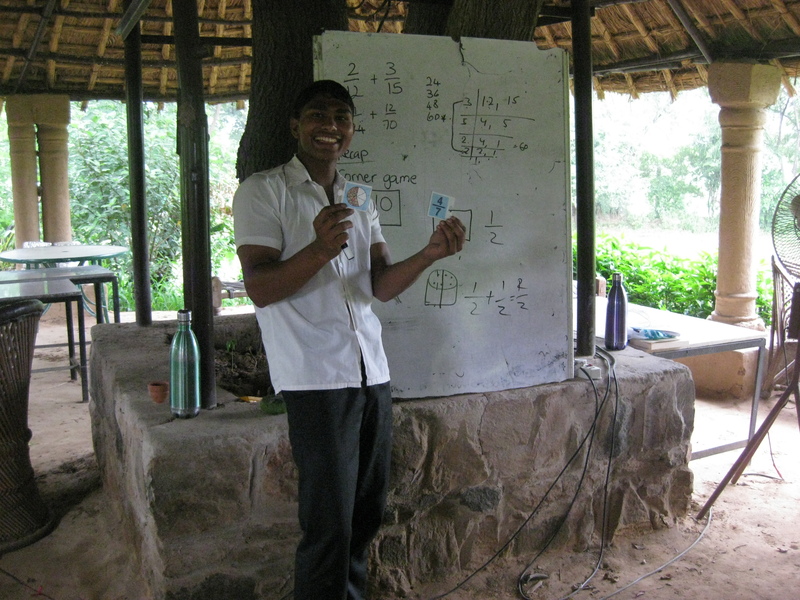 Today Mr. Ramesh and Mr. Sandeep taught the Maths and English lesson to all of us, as we had decided yesterday. Starter:-Counting 1 to 10 like so; one ,one two one, one two three two one, one two three four three two one etc. Activity: – First we introduced the rules of multiplying decimals, which are as follows: when multiplying move the decimal point to the right. The number of places depends on the number of zeroes.eg x10 move one place x100 move 2 places x 1000 etc. We will give them more sums to solve themselves. Activity 1:-Multiply decimals by 10, 100 and 1000, for this activity we used a number table. Starter: We sung this song ‘O, E, O, A, A Ting tang wallah wallah Bing bang’ as the starter activity. Activity1:- Type of articles Indefinite articles and Definite articles. A and An are Indefinite articles and use for countable nouns but ‘The’ is definite article and use before countable and uncountable nouns. If any word makes the sound of vowels then we use ‘an’ e.g. an elephant. An eight year old girl etc.If any word makes the sound of consonant then we use ‘a’ e.g. A girl. A buffalo etc. Recap:-Write the more sentences on black board and fill those blanks. Yesterday, I saw……. Taj mahal. 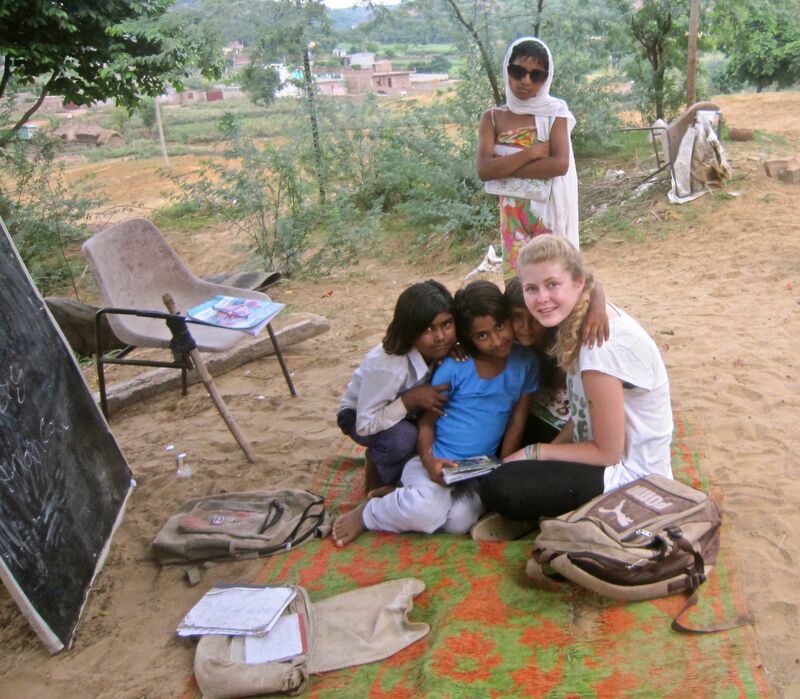 Evening: – Today Sarah went to Silakari centre, Molly went to Manger village Centre, Suzy went to Dhauj with Sheela. I and William went to Alampur centre today and we were very happy to see the keen interest of pupils towards their study. 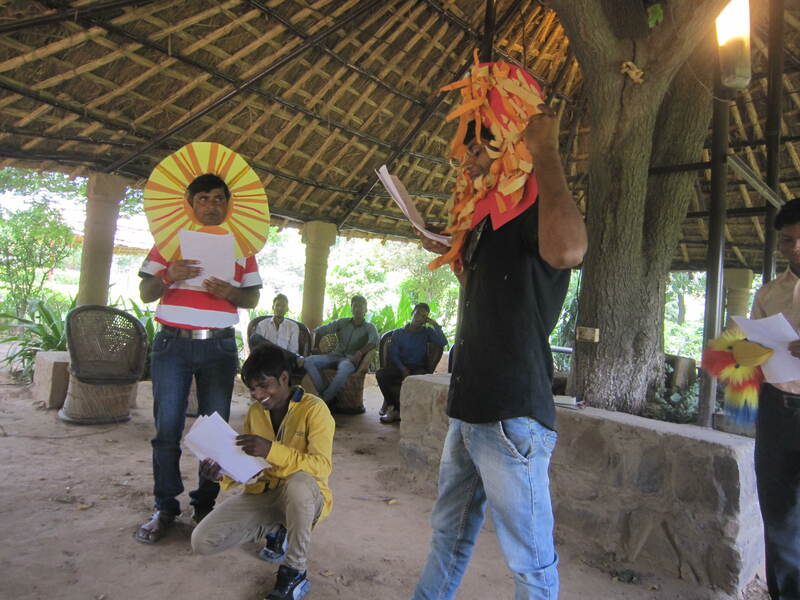 They all were learning well and the Laksh volunteers were teaching well to their groups. Chinese whispers: First the teacher whispers a sentence in the ear of a pupil and then the pupil will whisper to the next, etc, and the last pupil in the circle must stand up and say what they have heard. Aeroplane questions: Make a paper aeroplane and write any question or any sum and fly towards someone, then the pupils will solve or answer the sum. Articulate: Describe the word and then the pupils will guess the name of object. 20 questions: If someone has the name of any place or any person then the other pupils can ask 20 questions to know about the object. Increase the sentences in order with the name of fruits and vegetables. E.g. Yesterday I bought two bananas. Then the next pupil will increase the sentence; – Yesterday I bought two bananas and one apple. Thus the sentences were increased. We decided that the Laksh volunteers will teach English and Maths lessons in the morning session, so we can find out the improvement areas. Evening: – Today the volunteers went individually to different centres. Molly went to Dhauj, Suzy went to Manger Hill, William went to Silakari centre and Sarah went to Manger Village centre with their own plans. They all revised some exercises as per requirement of each centre. 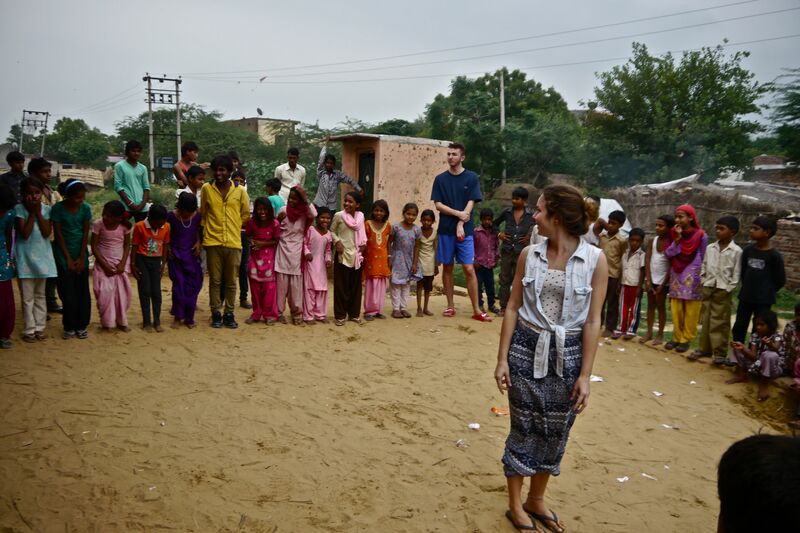 All the Laksh volunteers and the Warwick volunteers implemented two activities with the pupils. Today we played cricket with the Warwick volunteers in morning from 6.30 to 8.00. We all enjoyed playing cricket with them. After breakfast we planned out an English lesson and decide to focus on “Transport verbs”. Starter: – Introduce transport verbs on flash cards and practice spelling e.g. drive. Activity1:- Write the verbs on the board and then pupils have to match means of transport with each verb. g. a) Drive Car, Tractor, Bus, Truck, Lorry and etc. b) Fly Aeroplane, Helicopter etc. c) Sail Motor boat, Ship, Yacht etc. d) Ride Motor bike, Horse, Camel, Bicycle etc. e) Travel Train, Metro etc. For example: – 1) I…………a car. The following is an example of the more difficult exercise for older pupils, e.g. Every day we………….to school by bus. We can ask to the pupils that suggest the sentences. Recap: – “Sir says” make sure you use the verbs. Who has ridden on a camel? Etc. Maths: – Application to numbers. Starter: Recap addition and subtraction of fractions. Let them solve some fraction and after some time write the correct answer then they can tally their answer if someone wrong then can correct yourself. g. What is half of 20? What is quarter of 20? What is one third of 18? We can use objects to help pupils conceptualise this. Activity 2:- we can do it harder in activity 2 for example: – What is one third of 201? 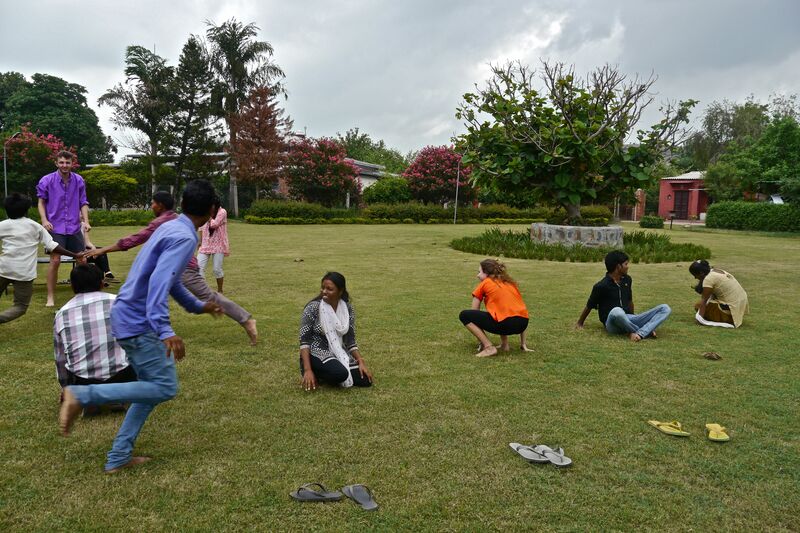 After the lesson planning we played Kho-Kho game with the Warwick volunteers and they enjoyed the game very much. We had lots fun today along with our lesson planning. Evening: – We decided that each Warwick volunteer will go to different centres. Today Suzy went to Dhauj centre, Will went to Manger village centre, Molly went to Manger Hill centre and Sarah went to Silakri centre. I visited four centres today. I saw lots of changes in Alampur centre. All the pupils seemed curious to study. Today we played cricket with the Warwick volunteers in morning from 6.30 to 8.00. We all enjoyed playing cricket with them. After breakfast we planned out an English lesson based on “Nouns”, but we decided to focus on transport. Starter: – Introduce the means of transport for example: – car, train, camel, ship, bus for younger pupils and motor bike, motor boat, elephant, rickshaw, aeroplane etc for older pupils. Activity1:- During this activity we divided the transport vocabulary into four groups. (i) Means of the transport of Air. (ii) Means of the transport of Sea. (iii) Means of the transport of Land. (iv) Means of the transport of Animals. Activity2:-Pronunciations of the spelling through flash cards. For further work we can make lots of sentences, for example: – a) In the sky an…………………flies. b) I travel in a …………on the Ocean. c) Under water I go in a ………………… etc. Recap: – Sir says” show me a bicycle” etc. Maths: – Subtraction of fractions. Starter:-Introduce the subtraction of the fraction with the help of rectangle shape. First show the rectangle and then half of the same and then the 1/3 . Activity1:- Subtraction of fractions is similar to addition: if you have common denominator then you can subtract the numerator as well for example:- 5/7 – 1/7 =4/7. Activity2:-We can make the activity harder: 1 for example: – ¾ – 1/8 = 5/8 etc. Recap: – Mini test of adding and subtracting the fractions. After the lesson planning we divided the Laksh volunteers into pairs. The Warwick volunteers observed the teaching of each group and shared their feedback. They explained that if you get any negative feedback then don’t be disappointed, don’t be nervous, take it in your stride. Thus, we can improve our skills day by day. 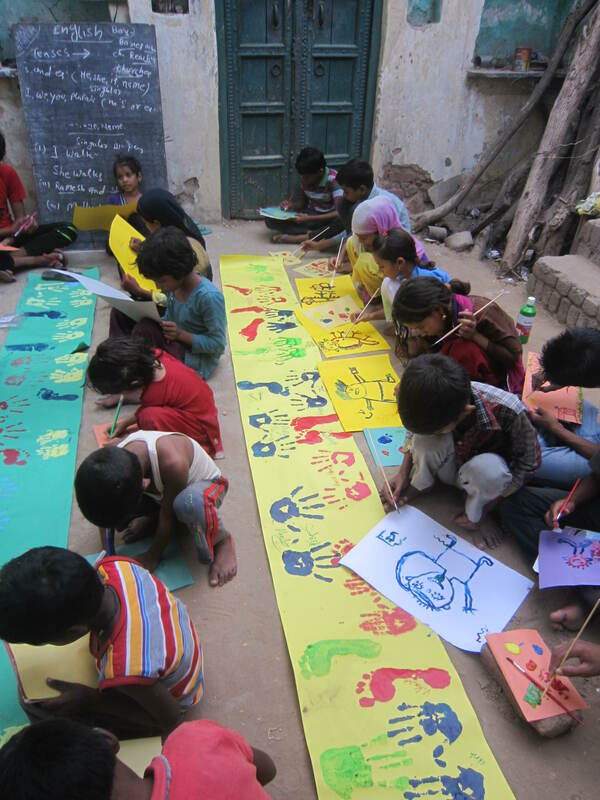 Evening class:- For evening classes we decided that Molly and Sarah will go to Alampur centre because we just opened that centre and we need more help there rather than the other centres. Suzy went to Silakari centre and Will went to Dhauj centre. I visited three centres today and I got the feedback from the centres without the volunteers. It was very impressive .I am very happy to learn that we are constantly improving our skills and knowledge. Today we planned out an English lesson on ‘Nouns’: class room objects. We identified 10 words for younger groups and 10 words for older groups, for example:-Table, pen, book, chair for younger and building , black board, cupboard etc for older children. Starter:-Pronunciation of letters, Alphabet A-Z: pupils say the letter out loud, use a ball or any object to correct their pronunciation. Introduce class room objects using flash cards. Activity 1:- practice spelling of the objects. We decided that we can use many methods e.g. 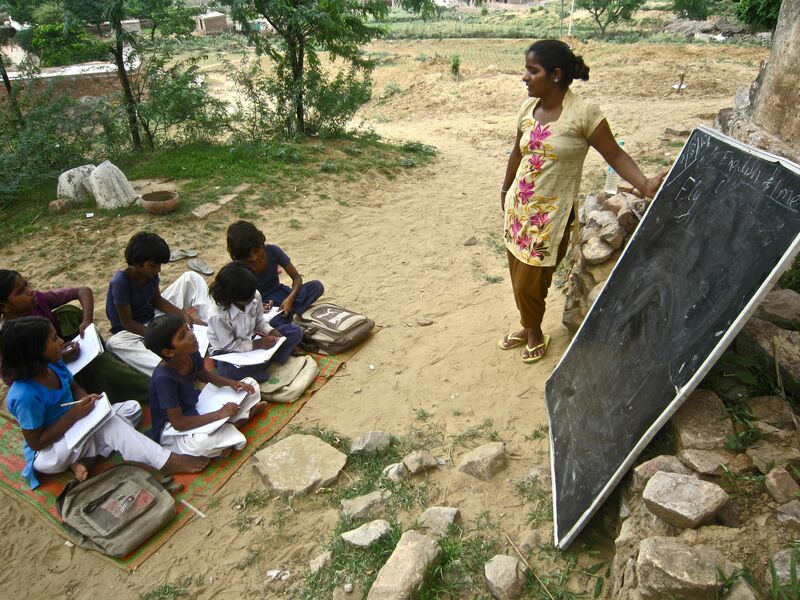 Look, cover, write and pick volunteers to write words on the black board. Spell words and then children will write on their note book. Activity2:- Teacher writes sentences with missing words e.g. I sit on a ………………….. The teacher writes on a………. In the…………….. the pupils face towards the………………..
And let them come up with their own sentences. Recap:-we can play two games using the objects like “Sir says sit on the mat”, and we can play ‘hang man’ with younger kids. Starter: – Introduce the fractions, what the fraction is? Like ½ is half and ¼ is quarter. Activity 1:- Show examples of common factors for younger pupils with the help of a circle or a rectangle and we can use any thing also for older pupils. Activity2:- Introduce the terms of fraction like (Numerator and Denominator) addition of fractions and then how to add the mixed fractions. Recap: – Corner game with fractions. Evening: – Today we divided the Warwick volunteers into two groups, Suzy and Will went to Manger Hill centre and Sarah and Molly went to Manger Village centre and they taught very well. I visited all centres and I saw tremendous changes among the pupils and teachers as well .We all are working hard to implement the lesson planning and make sure that the pupils grasp the information. I had a discussion with Alampur centre’s volunteers today, so they are participating in our project and they are enjoying it as well. Another blog to come tomorrow! After the first week with Group 2 finished, today the morning class discussed some key points about the previous week. 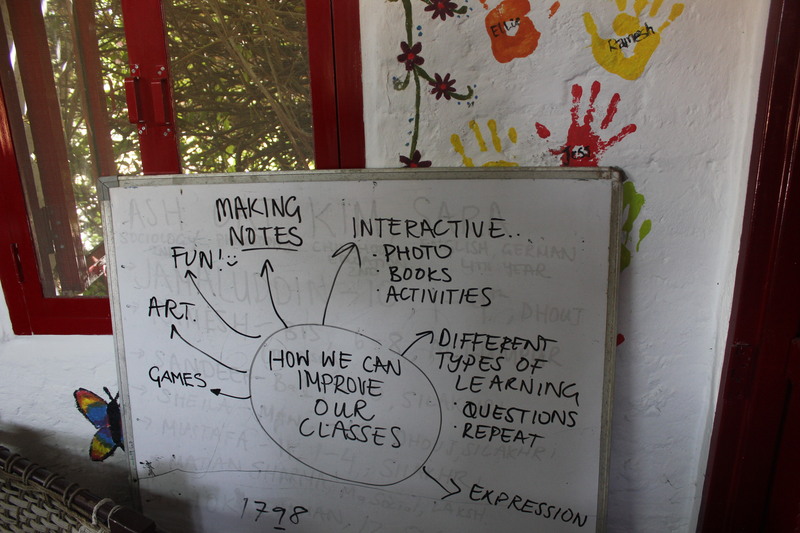 We discussed last week’s observation with Laksh volunteers and the teacher’s ideas moving forward. We found out that we have different age groups of pupils in our centres so we have to plan the lesson according to age group or according to the ability of the class. The Laksh volunteers wanted to know the topics that the pupils had already covered and short listed some topics for different age groups. Older group: (English) We realised we had to pay more attention to English readings, vocabulary, pronunciation of letters and words, difficult words and meaning, degree of adjective. Articles and modals. Younger Group:-English (Letters sound, make the words with different sound, English songs and games) wild animals name and sounds e.g Lion. Maths: – Timetables, telling the time and counting in thousands or higher etc. 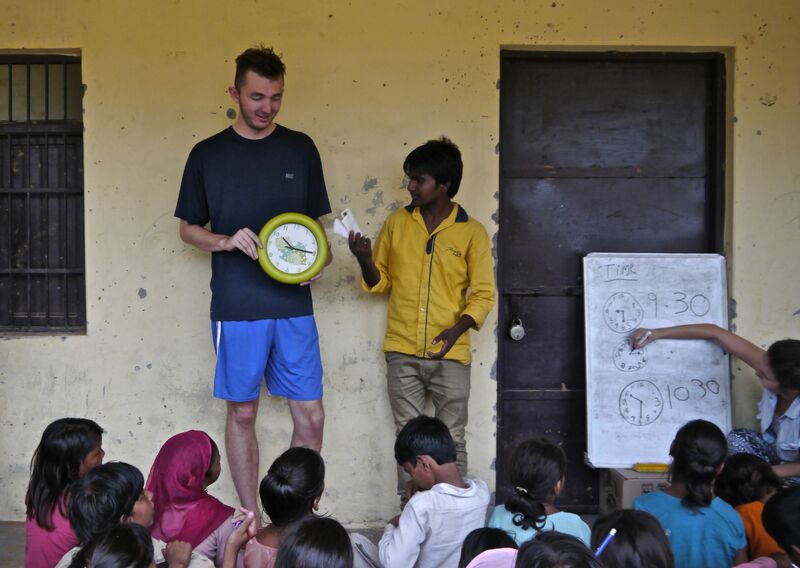 Warwick volunteers explained a game for younger groups about telling the time. It involved choosing one or two students and they would be Mr. And Mrs. Dog. The whole class would stand behind them and ask the time like “what is the time Mr. Dog?” then Mr. Dog will say “three o’clock”. Then all the students go ahead three steps and lastly Mr. and Mrs. Dog will say “dinner time” then all the students run away with Mr and Mrs Dog chasing them. Starter:-Introduce a clock to younger group by showing a clock or a picture. Ask the pupils to draw a clock in their note books. Explain the minutes, seconds and hours for example: – 60 seconds =1 minute or 60 minutes= 1hour etc. Activity 1:- Teaching about O’ clock and 5 past and 10 past etc. The pupils used their arms to tell the time. Activity2:- Draw lots of clocks in their books. The teacher then said a time and asked the pupils to draw the clocks for different times. For example:- point out wake up time, breakfast time, school time, dinner time etc. Evening Class: – We divided the Warwick volunteers into two groups. Molly and Sarah went to the Silakari Centre and Suzy and William went to the Alampur centre. Today, I visited Manger, Dhauj, and Silakari centres. I saw that everybody was working hard to implement the lesson planning .All the students were paying attention and they were trying to understand the lessons. During the recap activity we found out that the students learnt many things about telling the time and they all enjoyed the game as well.